Find original user-generated comparisons tables. Compare anything such as products, services, objects, software, websites, people... Your choices and decisions will be better and easier. You do not need anymore to be an expert to build powerful collaborative and interactive comparisons tables. Create or import easily original matrix with your own features list (tables with images, video, ratings, votes...). It is free! Share any comparison table you like with your friends (facebook, twitter, email...). Ask your friends to help you to choose giving their opinions: voting, rating, commenting and reviewing tables content. Are you a blogger? Share your passion embbeding tables with a custom design. Engage your community to vote, rate, comment. Maintain data in a collaborative way, getting updates suggestions. SocialCompare is an innovative comparisons sharing community. It is a flexible and free online solution to create or import easily your tables with your own criteria. Find and vote for the best ones. We believe in the power of community and collaboration. We would like to provide you an easy and useful tool to organize, edit, publish and share tables. Compare everything you want! All the people that want to share their knowledge or passion (technology, finance, politics, ecology...) via comparisons tables. Engage your community to vote, rate, maintain and comment your data. 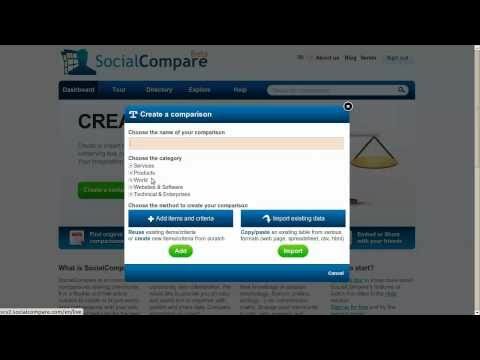 Take the tour to know more about SocialCompare's features or watch the video in the Help section. Sign up for free and try the service today!